The United bench watch on as Linlithgow go on the attack. Picture by Blair Smith. St Andrews United’s last fixture of the 2018/19 season ended in defeat against a strong Linlithgow Rose side still hoping to win the Conference C title. The Saints players knew that they needed to win all three points to stand any chance of claiming a place in next year’s East of Scotland Premier League and they began the match strongly. Daryl Falconer and Dylan Honeyman both tried their luck from distance during the opening five minutes. But Linlithgow scored the opening goal when Rod MacLennan found the top corner of Matt Curtis’ net after United’s trialist goalkeeper failed to clear his lines. 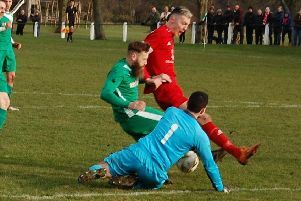 The visitors then doubled their lead in the 23rd minute when Gary Thom stabbed home a crossed ball from an unmarked position at the near post - yet the home players kept pushing forward in an attempt to get back into the contest. Falconer forced Michael McKinven into making a terrific save from point blank range, but the tall striker promptly received the ball from the resulting corner kick prior to curling a fantastic shot into the Linlithgow net. Both teams came close to scoring again as half time approached and the key goal went the way of the Rosey Posey in the 43rd minute when Tommy Coyne netted for the 40th time this season. That strike really knocked the stuffing out of the St Andrews United squad, although the 175 fans inside Barnetts Park enjoyed watching end-to-end action throughout the second half as both teams tried to play in an attacking manner. Unfortunately, the only goal of the second period went to MacLennan following a quick counter attack, but the home supporters were interested to see how debutante Scot Cunningham performed during the last ten minutes. The local teenager tested McKinven with a shot from the edge box before the referee’s whistle signalled the end of a disappointing season for all concerned with St Andrews United. Saints: Curtis, D Fleming, R Cunningham, M Fleming, O Fleming, McInnes, Honeyman, McManus (S Cunningham), Stark (J Wilson), Penman, Falconer.